Van Tran’s 2004 election to the state Assembly was as a shot across the political bow, serving notice that Little Saigon’s electorate had come of age and would be emerging in ways unprecedented by any other ethnic group in recent history. With Vietnamese American voters as his base, Tran trounced his well-known white opponent in the Republican primary by 14 percentage points and cruised to a general election victory by 21 points. 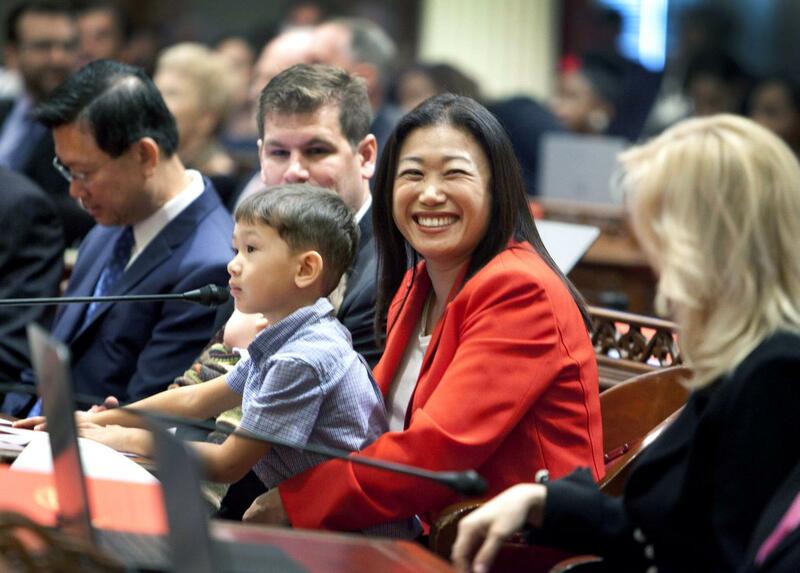 When he was sworn into the Assembly, Tran became the first Vietnamese American ever seated in a state Legislature. “It elevated the political clout of the Vietnamese community and people started paying attention to the community,” said Linda Trinh Vo of UC Irvine’s Asian American studies department. The groundswell, building for years, shows no sign of abating. Since Tran’s victory, Orange County has elected a Vietnamese American to the state Senate, two to the county Board of Supervisors, one as county clerk-recorder and more than a dozen to city councils and school boards. Vietnamese American voters have consistently shown they are more concerned with electing fellow Vietnamese than they are with party affiliation, regularly crossing party lines to vote for one of their own. And when Vietnamese are on the ballot, Little Saigon’s voter turnout can dwarf that of other ethnic groups. In January’s special election for county supervisor, Latinos had nearly 50 percent more of the district’s registered voters than Vietnamese. But Vietnamese cast 44 percent of the ballots and Latinos accounted for just 19 percent, according to an analysis by Political Data Inc.
Andrew Do, a former Garden Grove councilman, edged the better-known former Sen. Lou Correa for the win, despite splitting the vote with two other Vietnamese candidates. Latinos comprise more than a third of the population in 12 Orange County cities, yet six of those cities lack a single Latino on their city councils. But Vietnamese are well represented – sometimes better represented than non-Latino whites. That’s especially true in Garden Grove, where Vietnamese are 28 percent of the population but 60 percent of the City Council. 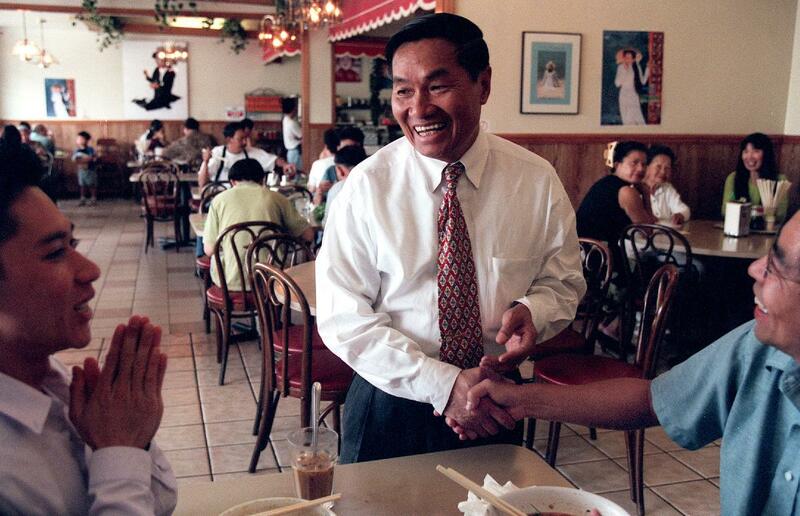 When Vietnam-born businessman Tony Lam was elected to the Westminster City Council in 1992, Little Saigon’s electoral power base was in its nascent stages. Just 9 percent of Westminster voters were Vietnamese, meaning Lam received more votes from outside Little Saigon than within it. Lam beat Margie Rice by 132 votes to become the county’s first Vietnamese elected official. His campaign spending came to $10 per vote and she spent $1 per vote, according to an analysis by Vietnamese American politics researcher Christian Collet, a former UC Irvine political scientist now at International Christian University in Tokyo. Among those working on Lam’s campaign was a 27-year-old Tran. “He spent a lot of resources courting mainstream voters with overarching issues such as being pro-business, anti-tax and anti-crime,” Tran recalled. The Vietnamese community wouldn’t become a significant factor in elections for another decade. Refugees’ attention was still focused on basic issues of survival and acclimation, UC Irvine’s Vo said. Additionally, just 39 percent planned on staying in the U.S., according to a 1994 poll by Collet. But the refugees became more settled, their offspring became adults and it became clear that there wouldn’t be a democratic Vietnam to return to any time soon. Within a decade, more than half said they planned on staying. Attention turned increasingly to local politics. Spurring growing voter participation was Tran. With a résumé that includes a degree in political science from UC Irvine and stints as a congressional and state Senate aide in the 1980s, the Republican Tran joined Democrat Chuyen Nguyen and others in 1994 to form the Vietnamese American Voters Coalition. VAVC registered and educated voters. Working hand-in-glove with Little Saigon’s ubiquitous Vietnamese-language media – about two dozen TV and radio stations, and three daily papers – Tran’s group helped create a political vehicle. And fueling the vehicle were impassioned, firsthand memories of tyranny in the homeland. When protesters staged a 53-day siege of the Hi-Tek video shop in 1999, Tony Lam was nowhere to be seen. The target of demonstrators’ fury was the Westminster store’s display of communist Vietnam’s flag and of revolutionary leader Ho Chi Minh. Lam said he steered clear of the fray on the advice of the city attorney. But his absence prompted protesters to accuse him of being a communist sympathizer and would lead him to leave political office in 2002. The watershed incident made it clear that the issue of communism was not only in play for local officials, but was an essential component when it came to voters in Little Saigon. Tran, who became the county’s second elected Vietnamese official by winning a seat on the Garden Grove City Council in 2000, pushed successfully for a so-called communist-free zone. The resolution had more bark than bite – it simply asked dignitaries from Vietnam to give advance notice of their visits and pay for police security. But it was the kind of measure that recently registered voters in Little Saigon rallied around. “Even though these are local elected offices, the community expects their politicians to have anti-communist positions,” Vo said. That reflex became automatic for the wave of Vietnamese American officials who followed, many of whom were Tran protégés. 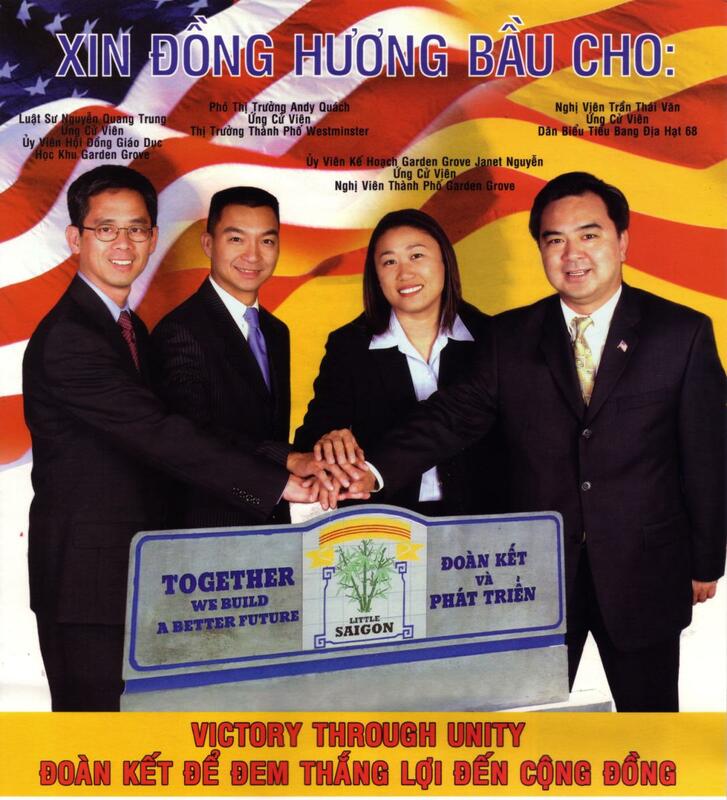 Well-known throughout Little Saigon for his influence and political network, Tran mentored Andy Quach, who was elected to the Westminster council in 2002, and Janet Nguyen, whom Tran appointed to two Garden Grove commissions and then endorsed in her successful 2004 City Council bid. Once elected, Vietnamese American officials have consistently reflected the community’s anti-communist sentiment with resolutions endorsing the use of the flag of the former South Vietnam, appearances at demonstrations outside meetings of officials visiting from Vietnam and letters to federal officials concerning human rights in Vietnam, among other gestures. As with most political movements, there were some bumps along the way. In 2005, Quach agreed to pay $11,500 in fines for illegally accepting cash contributions and improperly voting on a project proposed by a major donor. Voters were forgiving and overwhelmingly re-elected him in 2006. 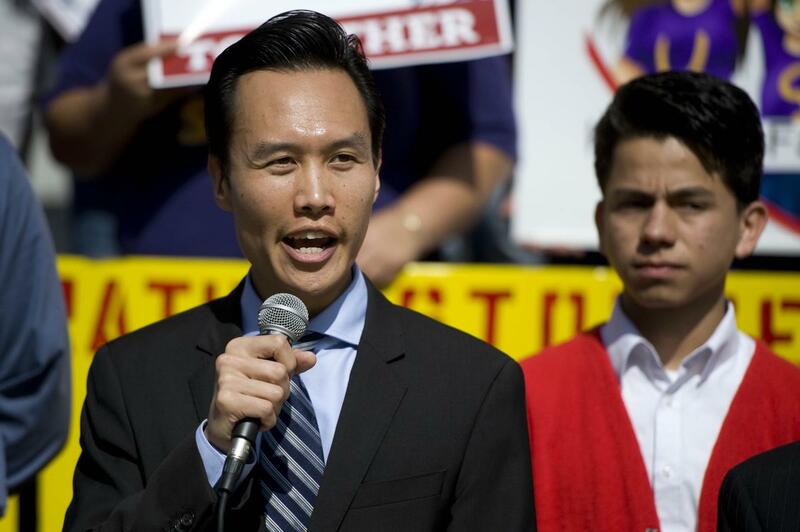 Tan Nguyen, who ran a 2006 congressional campaign independent of Tran’s network, mailed Latino voters a warning that they could be jailed if they voted illegally. He was found guilty of obstructing justice in the subsequent investigation into whether he illegally tried to suppress the Latino vote and served 10 1/2 months in federal prison. But the electoral muscle of the community continued to grow, even when there wasn’t a Vietnamese candidate running. In 2006, Tom Harman narrowly won the county’s coastal state Senate seat despite being outspent 3-2, due to being the only candidate to court Vietnamese speakers. When there was a Vietnamese candidate, Little Saigon’s political power was more dramatic – as demonstrated when Janet Nguyen ran in a 2007 election to fill a vacant county supervisor seat. By that point, Tran and Nguyen had a falling out for reasons that have yet to be publicly detailed. Tran threw his weight behind little-known school trustee Trung Nguyen in an effort to topple his former protégé. But the Nguyens finished in a virtual dead heat for first, with a court determining that Janet Nguyen won by three votes. There were 20 percent more Latinos than Vietnamese registered to vote in the district, but Vietnamese cast nearly four times as many ballots. While Vietnamese accounted for 25 percent of the district’s voters, they made up 45 percent of the ballots cast. 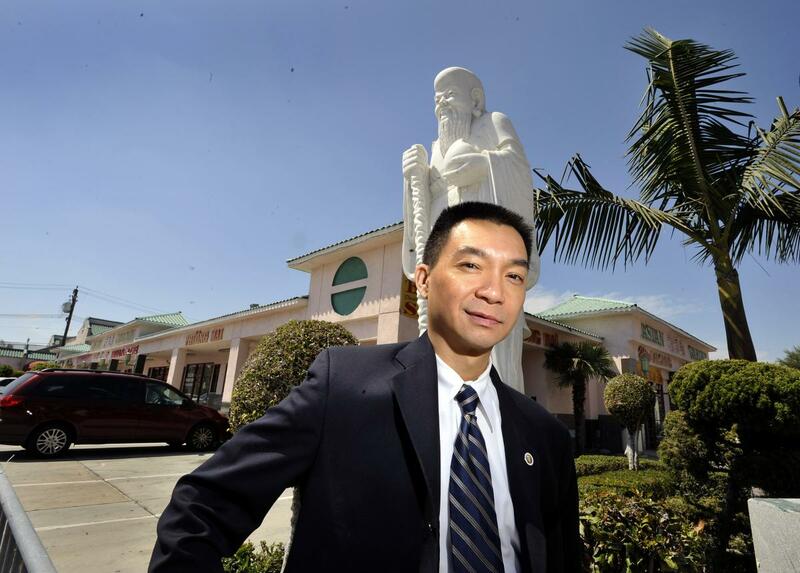 In February, the backlash came fast and hard against newly elected Garden Grove Mayor Bao Nguyen. In an increasingly common show of anti-communism, his four fellow council members signed a letter urging Riverside to rescind its sister-city relationship with Can Tho, Vietnam. But Nguyen declined, saying one city shouldn’t tell another what to do. Nguyen was denounced as pro-communist and there was talk of a recall. Nguyen immediately responded with a news release in two languages, emphasizing his opposition to communism in Vietnam and to Garden Grove having a Vietnamese sister city. “One has to conclude that a visible and firm anti-communist position still matters,” Collet said of Nguyen’s response. But Nguyen’s press release called on residents to focus on purging corruption from the city. That effort to shift anti-communist energy to domestic issues signaled a new generation’s approach to politics, Vo said. Tony Lam, 78, retired from politics more than a decade ago. Van Tran, 50, is attending to an international business consultancy enterprise after losing a congressional race in 2010 and a state Board of Equalization bid in 2014. Janet Nguyen, 38, was elected to the state Senate last year. All are Vietnamese-born Republicans, elected largely by fellow Vietnam natives. 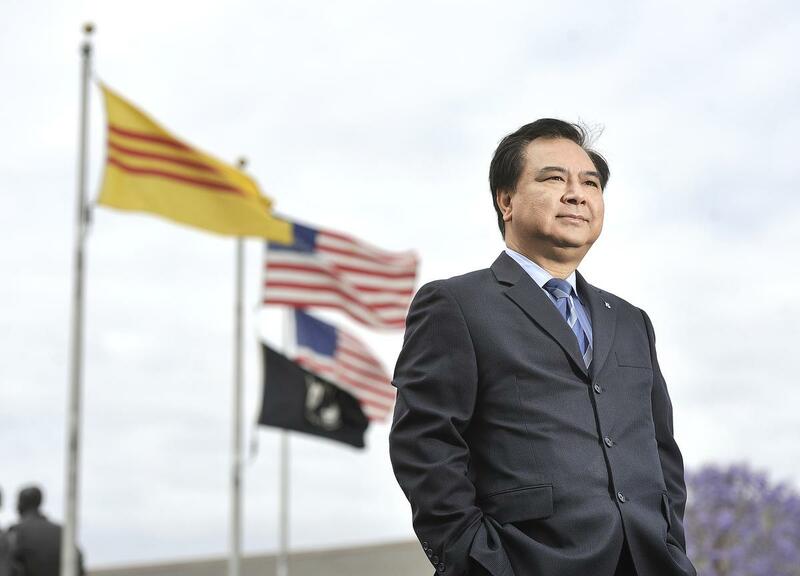 While Nguyen’s political career is ascendent, Bao Nguyen represents the next phase of Vietnamese American officials. Bao Nguyen, 34, was born in a Indonesian refugee camp after his parents left Vietnam. His first language is English. He’s a Democrat and a union organizer, and he sees the legacy of communist Vietnam living on in future generations through a dedication to honest government and human rights everywhere. 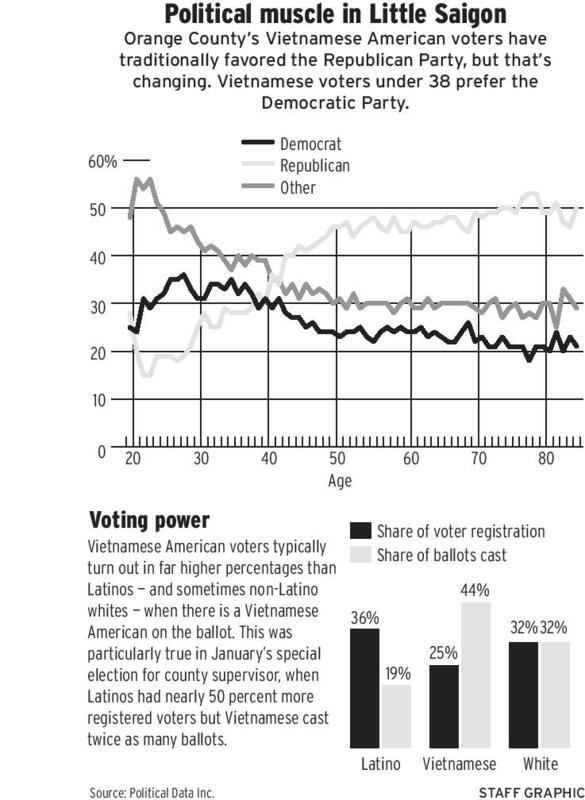 Unlike their elders, Orange County’s Vietnamese Americans under 37 are more likely to be registered as Democrats than Republicans. Those under 30 are more likely to be born in the U.S. than abroad. With the population is increasingly assimilating, Collet expects their level of engagement to continue and their politicians to rise to new heights. Westminster city councilman and mayor pro tem, Tony Lam, center, chats with customers in his Garden Grove restaurant Vien Dong. Lam has been under fire from the Vietnamese community for not shwoing up during the massive protests in Little Saigon earlier this year. He will be holding a $100 per person fundraiser at the Waterfront Hilton next week to help pay for his legal expenses. Westminster City Council member Andy Quach pauses along Moran Street in Little Saigon. He would like to revitalize Little Saigon and make it a more inviting destination for residents and tourists. ///ADDITIONAL INFO: littlesaigon – Photo by H. Lorren Au Jr. / Orange County Register. Garden Grove mayor Bao Nguyen speaks during a press conference hosted by Orange County Immigration Coalition on the steps of the old courthouse in Santa Ana to talk about DACA and DAPA on Wednesday. ///ADDITIONAL INFO: IMMIG.OCCOALITION – 2/18/15 – PHOTO BY JOSHUA SUDOCK, STAFF PHOTOGRAPHER – Orange County Immigration Coalition holds press conference on the steps of the old courthouse in Santa Ana on Wednesday to discuss DACA and DAPA. Picture made at the old courthouse in Santa Ana on Wednesday, February 18, 2015. Left to right: Truong Nguyen, Andy Quach, Janet Nguyen and Van Tran.